The prime numbers 2, 3, 5, 7, 11, 13, 17… are those whole numbers with no factors, numbers that divide evenly into larger numbers, other than themselves and 1. 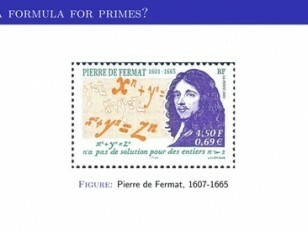 They are the building blocks of arithmetic and have fascinated mathematicians for millennia. To a large extent, however, they remain mysterious. This lecture will explain a little of what we do understand about them and will also try to explain some reasons why their study has proven so difficult.